Common Names: Jardini Arowana,Australian Pearl Arowana, Gulf Saratoga, Jardini, Northen Saratoga, Northern Spotted Barramundi, Saratoga. Origin: Jardini Arowana (Scleropages Jardini) are native to northern Australia and New Guinea. Feeding: Jardini Arowana (Scleropages Jardini) will eat anything small they can fit in there mouth, they will eat Fish, crayfish, insects, shrimp, ect. Jardini Arowana (Scleropages Jardini) can also be trained to eat pellets that can be purchased at any pet store. Aquarium : Scleropages jardinii (Australian Pearl Arowana) is constantly swimming back and forth in the aquarium therefore they require a lot of open space to swim. They are a top swimming fish so most of the time they will be swimming up on the top of the aquarium. Jardini Arowana (Scleropages Jardini) are also jumpers so the aquarium must be covered. Jardini Arowana (Scleropages Jardini) are peaceful fish and can be kept with any other fish that is large enough that they can not fit in there mouth, but will become aggressive towards each other if more then one is in the same tank. 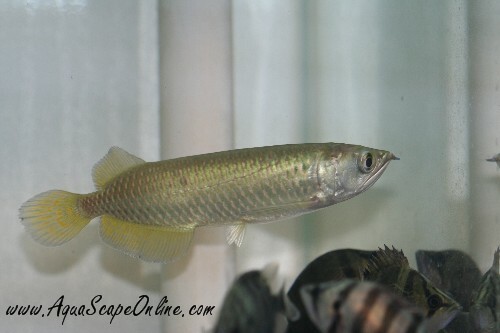 Breeding: Jardini Arowana (Scleropages Jardini) are hard to breed but not impossible they require very large aquariums. Jardini Arowana (Scleropages Jardini)is a mouth brooder and will keep the fry in and around her mouth until they are 4-5 weeks old. Page displayed in: 1.6079 seconds.